Worthing Raiders assistant coach Ben Coulson insists things are coming together for his side this season. 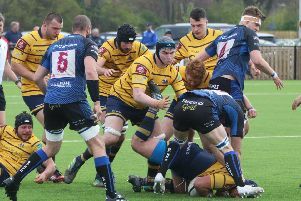 Once again there were a number of positives but Raiders eventually succumbed to a 37-30 National 2 South defeat at promotion hopefuls Bury St Edmunds on Saturday. A good start saw Worthing lead 15-3 at one point, before a late fightback saw them recover from 37-15 down early in the second half to claim two bonus points. Raiders have faced four of the current top seven in their past four games, which has coincided with six consecutive league defeats. Despite the difficult run of results, Coulson has seen signs to give him belief things will start to turn around in the coming weeks. He said: “Once again we had a number of positives to take from the match. We’ve played some scintillating rugby this season, on both sides of the ball, anyone that has been to watch us will tell you as much. “We’ve scored seven bonus points to date, only Redingensians have scored more, which shows we are scoring tries and when we lose it is close. Raiders were reduced to 14 men late in the first half as Jide Ajayi was sinbinned. Bury recovered to go in to half-time level at 15-15, which Coulson felt handed them the initiative. He added: “We should have gone in to the break seven points ahead, with a full quota of players on the pitch. Instead, we were a man down, level on the board but still in the match. Raiders currently sit 12th in the table and will be hoping to halt a run of six straight defeats when they welcome place-above Tonbridge Juddians to Roundstone Lane on Saturday. Though it presents itself as a winnable fixture, Raiders assistant coach Coulson knows a sizeable task awaits. He said: “Of course we are looking to get back to winning ways this weekend, but make no mistake, Tonbridge Juddians are a very well coached, strong and physical team. “They’ve adapted well since being promoted, we’re excited to be back at Raiders HG, in front of our supporters, for what will be another big challenge.